Arsenal recently announced their plans for the pre-season of 2016-17 which involve two games played across the pond in the United States. 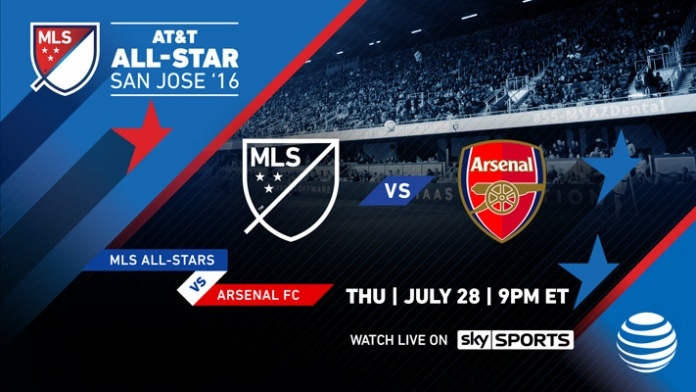 These two matches, one against the MLS All-Stars at the Avaya Stadium in San Jose on the twenty eighth of July at 9pm ( ET ), and the other against Chivas de Guadalajara at the StubHub Center in Los Angeles on July the thirty first, represent a welcome return to the States for Arsenal. The last trip to the US was in 2014 and involved a game versus New York Red Bulls, which was ridiculously well received. This is not a surprise, as currently there are sixty three branches of the Arsenal America Supporters Club. This represents a huge chunk of support and it shows that the decision to take the squad across the Atlantic should not be viewed as purely a commercial decision. From Seattle to Syracuse, Arsenal are well followed in the States. Of course, it would be naive to overlook the huge revenue opportunities this trip to the USA will bring. Merchandise and grabbing a larger share of a near untapped market could reap a huge turnover, and with Chelsea, Manchester City, Manchester United and other rivals recently attempting to cut a bigger slice from the America cake, it is high time that our club asserted themselves in a fashion that befits the stature of our club. The constant lists and charts which show Arsenal as a football superpower, such as income and matchday revenue – but more importantly, the sheer amount of online presence that our global fanbase generates shows that Arsenal simply cannot continue to gear up for the season with nonchalant, relaxing, but ultimately small scale friendlies versus Austrian Third Division Amateur teams. In an ideal world, all of our overseas fans would get ample opportunity to see the team they adore when we trek up to the Austrian Alps as Arsene Wenger puts his boys through their paces in the most idyllic of settings, free from exhausting flights and time spent at airports and being shuttled from place to place. We are all aware of the negative impact a hectic pre-season schedule can bring. It can hinder a squad in their attempts to gain success as the time spent training before the season begins, act as a foundation for each player. Remember Mesut Ozil in his first season? We cannot ignore that our club – along with any other club contending for honours – is now a business. The cynical view is that every supporter is merely a number, and to an extent it is correct. The Board would be fools if they ignored opportunities to make us fans spend more on matchday. However, they will be more than aware of fan power and how important it is to keep people filling the seats. As long as the turnstiles keep turning, then the current business model will continue. Seeing as our club is a well-oiled machine in terms of money-making, this trip to the USA makes perfect commercial sense. It gives our huge amount of US Gooners a slim chance to see their team play live and it also will be like an Arsenal superstore opening for the duration of their stay – but a shop the size of the American West Coast. This trip to the United States is two matches. Including flights, it will be six days. It may take us perilously close to the first match of the domestic season, but it could also act as the final step in a pre-season which is slowly amped up in terms of intensity. It isn’t the most desirable of trips, but the duration is short and whilst our players are not exactly the most durable, they should be able to endure these particular demands. Plus, it will forge an even stronger team bond and the USA will be fun for the squad. The gargantuan amount of Gooners in the States demand that Arsenal incorporate visits across the water. It will be a spectacle for fans who are able to attend and will also be great to see if the MLS has closed the gap on the difference in standards. With players of the ilk of Kaka and Andrea Pirlo hopefully able to take to the field – the Arsenal Player on the clubs website will be in full effect. The people at Sky Sports have obviously cottoned onto this and have already declared their coverage of the two-match tour. This shows that there will be much interest and demand will be high. This could be the blossoming of a beautiful partnership.